← Bridge Tender’s Nightmare Made Worse? CVA – AM578 – B.C. Hilliam fonds. The Oct. 17-18, 1913 program, “The Queries”, Lonsdale Theatre, North Vancouver. Note: This is one page from the program, the entirety of which appears below. North Vancouver Archives. Accession 1986-015. The Queries, 1914. B.C. 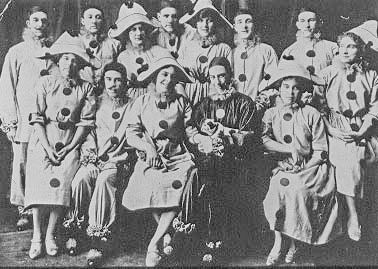 Hilliam appears in front row dressed in dark “Pierrot” costume (in contrast to white Pierrot costumes worn by other Queries); I think the woman at left from BCH is Florence Hayward. Photographer unknown. In 1913, B.C. Hilliam was working for the North Shore News and trying to launch a future career as a professional musician/composer and (ultimately) as a notable comedian. Hilliam was still a relative unknown in North Van and, arguably, a complete unknown across Burrard Inlet in the City of Vancouver. In 1913-14, Hilliam, together with a number of other amateur actors, assembled a vaudevillian group known as The Queries. This group was from North Vancouver. 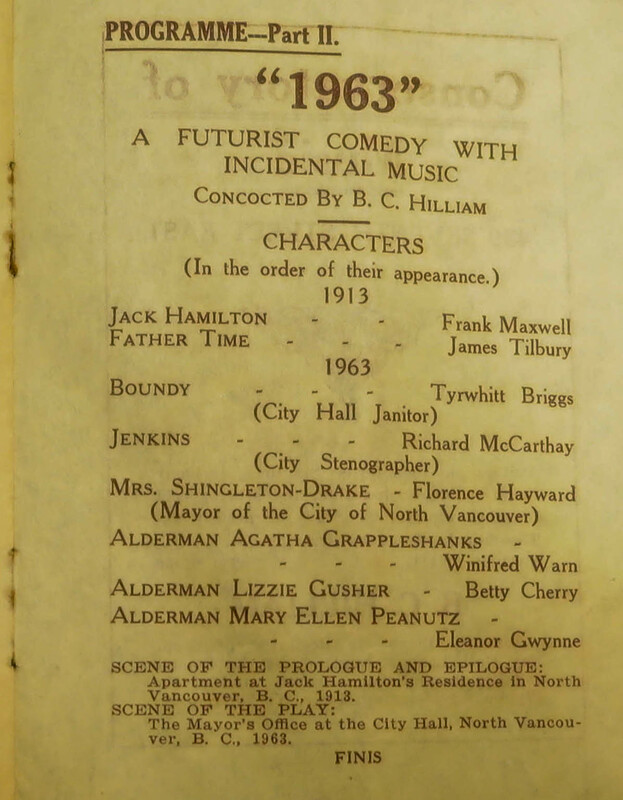 In one of the earliest performances put together by the troupe – in October 1913 – a playlet was performed, written by Hilliam, entitled 1963: A Futurist Comedy with Incidental Music. 1963 was Hilliam’s first run at a similar idea which he would undertake two years later in the City of Vancouver. More on that in the next section. 1963, by Hilliam and The Queries, seems to have had three parts to it: a prologue and epilogue (both set in the ‘present day’ of 1913), and the bulk of the play, set in North Vancouver’s ‘future’: 1963. Specifically, the ‘future’ of North Vancouver’s civic politics — a very different future from the 1913 reality, in which the civic council was made up entirely of women (Aldermen Grappleshanks, Gusher, and Peanutz) and among whom was a female Mayor, one Mrs. Shingleton-Drake. The Queries finished acting together by 1914. By the end of that year, Vancouver’s Pageant of 1914, had been successfully hosted in the City and with Vancouver’s profile had risen Hilliam’s reputation as a local composer with his tune for the City’s ‘Toast Song’, Here’s a Ho! Vancouver. In 1915, a new vaudevillian group based in the City of Vancouver was launched: the 1915 Follies — a somewhat loose confederation of amateur actors (‘loose’, in the sense that the Follies had a pretty fluid cast, with the exception of B. C. Hilliam, whose name was synonymous with the Follies). One of the early Follies performances, held at the Imperial Theatre in February 1915, was a play called Fifty Years Forward, or Vancouver in 1965 (which I’ll refer to simply as 1965). Although there is no extant script available for either 1963 or 1965, to the best of my knowledge, there are two press accounts of which I’m aware in the Vancouver Daily World — one on February 20th, anticipating the 1915 production (and based, I assume, on a dress rehearsal of the play attended by the reporter; and one on February 23rd, reviewing it). The most noticeable difference is that of the length of the productions. While the 1913 offering in North Van was described as a ‘playlet’ (it was but one aspect of a full evening of varied entertainment), the 1915 Follies production seems to have been devoted entirely to 1965. Whether this is as substantive a difference as it at first seems, is open to question, however. While the entire evening in 1915 may have been described as Fifty Years Forward, a number of the components of the ‘longer’ play seem not to have been directly related to the plot of 1965. This seems to be a genre feature of vaudeville; what today might be viewed as ‘padding’ was expected as a warmer-upper of the audience of the time. Such numbers included: the singing of “The Little Kerchief” by Miss Anne Lochead,² a duet by Lochead and Edgar Meyrick of “The Keys of Heaven“, elocution by Mr. E. (Ernest) V. (Vanderpoel) Young of Chevalier’s “The [An] Old Bachelor“, Miss Florence Hayward singing a piece of Hilliam’s own composition, “The Daughters of the Empire”³, and songs by Miss Phyllis Davis (“I’m a Nurse” and “I’ll Make a Man of Everyone of You”²). There was also Spanish dancing by Miss Millicent Ward, and recitation by the entire Follies company of the nursery rhyme, “Three Blind Mice”. And all of these performances happened before 1965 got underway! In both 1913 and 1915 plays, the ‘present day’ mayor was a Mr. Hamilton. However, the 1963 ‘mayoress’ is a Mrs. Shingleton-Drake, about whom nothing is known by me, except that she presumably was not the wife of Hamilton. But in 1965, the ‘mayoress’ of the future was, indeed, Mrs. Hamilton (the wife of the 1915 mayor). Quite how they got around the 50-year aging issue for Mrs. Hamilton, I have no idea. One of the lady alderman characters from 1913 was retained in the 1915 play: Mrs. Grappleshanks. The other two weren’t mentioned in either 1915 press report. “Boundy”, the City Hall janitor in 1963, seems either to have been dropped from 1965, or else was not considered worthy of mention in either press report in 1915. “Jenkins”, the stenographer in 1963, became a female character in 1965 (the character’s name is unknown by me) and was played by Phyllis Davis. She drew the only critical comment from the reviewer: “Miss Davis is there with the goods, as the mayor’s stenographer, but loses a little bit of her charm by overdoing slightly some portions of the part, as for instance, the gum chewing”. That’s her told! From Vancouver Daily World, 10 August 1915. 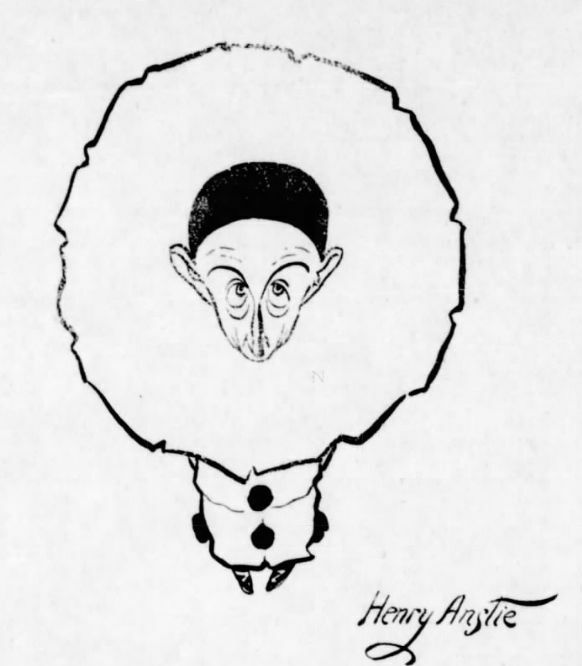 Henry Anstie caricature by B. C. Hilliam. (Anstie is here dressed in a white pierrot costume; it seems a bit dated for the Follies, and more apt for The Queries). Florence Hayward was the stage name of “Madam (Florence) Norminton” (1882-1958), who was instrumental in getting Hilliam out of his newspaper day-job and into the North Vancouver theatre scene. She participated in The Queries in North Van with Hilliam and later joined him in his 1915 Follies group. Betty Cherry (“Alderman Gusher” in 1913) was also using a stage name. Her real name was Harriett A. Parker (nee Franklin) (1887-1970). A noteworthy member of the 1915 production was Henry Anstie, who played the ‘present’ Mayor Hamilton. Anstie was a stage name; his real surname was Chrimes and he was best known for playing comic roles well. As I reflected upon these plays, it occurred to me that, although there have been female aldermen in Vancouver, we have yet to have a woman in the Mayor’s chair. In that sense, the plays were ahead of their time — and ours! ¹And this, in turn, causes me to wonder how much detail we are missing out on by not having a script of either or both 1913 and 1915 productions. If any readers are owners of these scripts or other ephemera relating to these productions, may I encourage you to donate it (or them) to a local civic archive, such as the City of Vancouver Archives? ²Lyrics and music by person(s) unknown. ³I’m not aware of an extant copy of the sheet music for this tune. That it was composed by Hilliam (lyrics by someone else, presumably? ), comes from the Daily World (Feb 23, 1915, p. 8). It is possible that it was a variation on another of his compositions as a tribute (at this Follies production) to the Imperial Order of the Daughters of the Empire (I.O.D.E. ), specifically the John Jellicoe chapter, to which organization all proceeds from the 1915 production were to go. This entry was posted in theatre/vaudeville/cinemas and tagged "1915 Follies", "Here's a Ho! Vancouver", 1963, 1965, B. C. Hilliam, bc, Florence Hayward (Norminton), Harry Anstie (Chrimes), history, imperial theatre, north vancouver, The Queries, vancouver, Vancouver Pageant of 1914. Bookmark the permalink.